Sediment transport in irrigation canals influences to a great extent the sustainability of an irrigation system. Unwanted erosion or deposition will not only increase maintenance costs, but may also lead to unfair, unreliable and unequitable distribution of irrigation water to the end users. Proper knowledge of the characteristics, including behaviour and transport of sediment will help to design irrigation systems, plan effi cient and reliable water delivery schedules, to have a controlled deposition of sediments, to estimate and arrange maintenance activities, etc. The main aim of these lecture notes is to present a detailed analysis and physical and mathematical descriptions of sediment transport in irrigation canals and to describe the mathematical model SETRIC that predicts the sediment transport, deposition and entrainment rate as function of time and place for various flow conditions and sediment inputs. The model is typically suited for the simulation of sediment transport under the particular conditions of non-wide irrigation canals where the flow and sediment transport are strongly determined by the operation of the flow control structures. 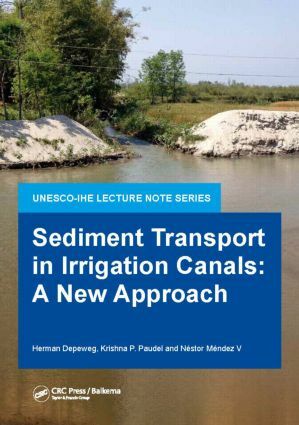 The lecture notes will contribute to an improved understanding of the behaviour of sediments in irrigation canals. They will also help to decide on the appropriate design of the system, the water delivery plans, to evaluate design alternatives and to achieve an adequate and reliable water supply to the farmers. Herman Depeweg, his research topics at Delft Hydraulics were related to hydraulic structures and sediment transport. He joined IHE in 1986 to lecture in hydraulics, computer applications and irrigation with the focus on all engineering aspects of irrigation at main, tertiary and field level. At IHE he has guided several MSc and PhD researches in sediment transport and has given guest lectures for UNESCO-IHE around the world. Krishna Paudel obtained in 2010 his PhD degree and his research topic has been the role of sediment in the design and management of irrigation canals. He has more than 24 years’ experience in the planning, design, construction, monitoring and management of irrigation projects. Currently, he is associated with Consolidate Management Services, Nepal and provides his professional expertise in water resource development projects. Néstor Méndez obtained in 1998 his PhD degree and his research topic has been the transport of sediment in irrigation canals. He has been associate professor at the Universidad Centro Occidental ‘Lisandro Alvarado’ at Barquisimeto, Venezuela. Since 1999, he is also guest lecturer at UNESCO-IHE and at several universities in South America. At present, he is active as consultant in land and water development in Venezuela.